Rory McIlroy admitted he had simply not played well enough after his third attempt to complete the career grand slam failed to spark into life at Augusta National. McIlroy needs victory in the Masters to become only the sixth player to have won all four major titles, but never fully recovered from a slow start in the opening round. The 27-year-old battled back from being three over par after eight holes to card an opening 72, but subsequent scores of 73 and 71 meant a closing 69 left the four-time major winner well off the pace on three under par. 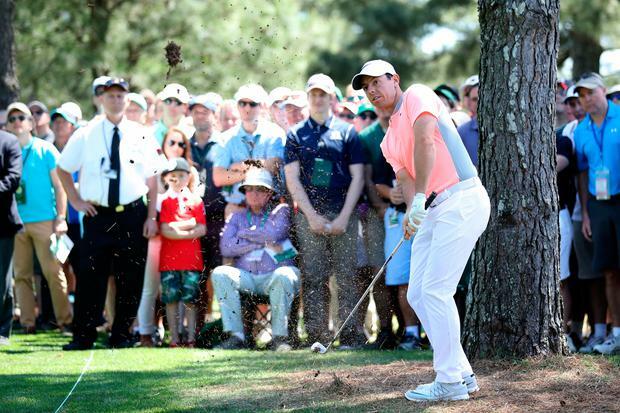 "It wasn't quite as adventurous as previous Masters have been for me," McIlroy said. "I didn't get too high with some really low nine-hole scores, but I didn't shoot any nine-hole scores that were in the 40s. It was quite a consistent, steady Masters for me. "It wasn't quite good enough. I felt like I had an opportunity yesterday to shoot something in the mid to high 60s which would have got me closer to the lead today and I didn't quite do that. "I gave a decent account for myself and will come back next year and try again." McIlroy felt he still had a chance of claiming a first green jacket if he could match, or better, his lowest score in the Masters, a 65 in the first round having seemingly set him on course for victory in 2011. However, after making a birdie on the par-five second, the Northern Irishman three-putted the fourth from 95 feet and had to scramble to save par on the next two holes. Birdies on the eighth, 13th and 16th ensured McIlroy broke 70 for the first time this week and he refused to blame a limited schedule this year - caused by a rib injury - for his performance. "I feel the time off was more of a blessing," he added. "I got to work on some stuff in my short game. I felt as comfortable on the greens here as I ever had, even though I had a couple of three-putts. "But I holed some good ones. I had a couple of pars when I needed to. I didn't convert the chances I should have yesterday but every time I come back here I'm more and more comfortable."